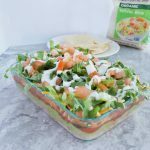 Layers of seasoned rice, guacamole, salsa, shredded cheese, and veggies for an easy mexican layer dip that tastes just like your favorite burrito! In a small bowl, mix cooked rice with 2 tablespoons of salsa. Layer rice in a glass bowl or dish, and spread evenly. Spread guacamole on top of rice mixture. Add salsa evenly over guacamole. Sprinkle black beans over salsa layer. Add shredded cheese to black beans. Dollop with sour cream or Greek yogurt if using. Rinse and drain black beans if using canned. You can also use pinto or refried beans. Cook your rice ahead of time, or use up leftovers to make this recipe super speedy. Buying pre-made guacamole is a big time (and $$) saver. I usually find mine in the produce aisle. Want to make it vegan? Just skip the cheese and sour cream/yogurt!